The Warren Junior Programme has its beginnings in 2001. The objective of the scheme is to provide junior players with the opportunity to work on their game under professional supervision at the range and on the course, and to develop their game to a competitive level. Starting with a pioneer group of about 50 youngsters, the enrolment has grown to a sizeable following of about 90 juniors training once a week under the watchful eyes of the Club’s Professionals. Using the full extent of the Club’s resources, the juniors are treated to a full repertoire of coaching activities thrown up by the programme. Apart from range practice, the juniors have special access to the course, junior competitions and an offsite camp at the end of the year. Every year a junior competition is held during the June school holidays to help them develop competition experience. Junior players from other golf clubs are also invited to the event, giving our juniors a chance to gauge their skill level against others. These other golf clubs reciprocate by inviting our juniors to their own respective competitions, thus giving our young players a chance to play on different courses. This year, inter-club events were arranged with Singapore Island Country Club (SICC) and National Service Resort and Country Club (NSRCC). Warren emerged undefeated in all these meets. The Ladder is open to all Golfing Junior Members with official handicaps. The Overall Ranking is based on their average strokes from participation in the Adult and Junior Monthly Medals with awards being given for both Gross and Nett categories. 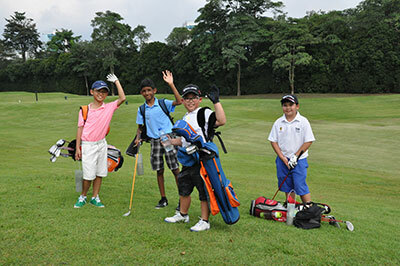 Each year end, golfing offsite camps are organised to places such as Johor, Batam or Bintan, giving the juniors yet another opportunity to play overseas and for parents to get together with their children in a golfing environment. Clinics and friendly competitions are held to inject camaraderie and excitement into these outings. Changes were made to the programme in 2009 to instill more excitement, reward and stimulation into each activity. The widening of the training syllabus, more time slots and mini tournaments and allocation of more space on the course were designed to cater to a burgeoning and eager following. We even launched an Intermediate (Advanced) Training Programme to specially nurture those juniors who have been talent spotted for their potential in performing and excelling at the next higher level. If you are looking for a way to bolster your kids’ natural talent in golf, sign him/her up for the golf training programme and unleash the true potential in him/her. Any enquiry on the above training programme may be made by contacting the Muru Golf Academy at 6760 6038 or email to muru@murugolf.com.